The first thing you’ll want to do when you arrive is find your way around. If this is your first visit to Club MAC, then here’s some basic information to help you access services and extras to make your holiday as enjoyable as possible. If you’re returning to Club MAC on holiday, it’s worth checking out what’s new on site for 2018. Our resort covers an area of 100,000 square metres (almost 25 acres) and is packed with fun things to do, spaces in which to relax, swimming pools restaurants, bars and sporting activities. We’re less than 1km away from the gorgeous sandy beach in Alcudia, which has particularly shallow waters ideal for family splashing. If you don’t fancy the walk, then there’s a free shuttle bus running throughout the day to get you to the beach. Club MAC itself surrounds two natural lakes, that are part of the S’Albufera wetlands, so it’s a combination of natural beauty and formulated fun. We are the choice for families wanting a fun-packed summer holiday in an area with guaranteed sunshine and plenty on offer. There are three accommodation buildings on site: Saturno, Marte and Jupiter. All these buildings offer a variety of rooms, ranging from Standard doubles to family suites. Extra facilities can be hired, depending on your package, including in-room WiFi, baby equipment and much more. You’ll find reception in the Marte building and, on arrival, this is where you’ll receive your all-inclusive wristband and get all the info you need for you stay. 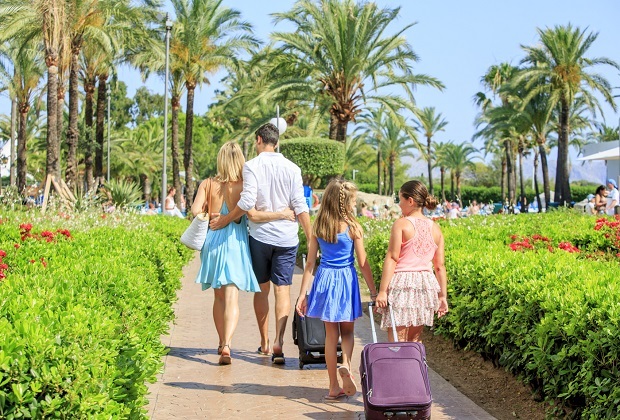 At reception you can also exchange pounds to Euros (any extra charges during your stay will be in Euros), book organised excursions or hire a car to explore Mallorca in your own time. On the first floor of the Saturno building you’ll also find the ironing room and the meeting point for TUI holidaymakers welcome talks. Brand new for 2018 on the same floor of Saturno is a soft play room specially to keep the little ones entertained. Over in the Marte building you’ll find the Guest House, which has all the information about sporting activities on site (this is everything from table tennis to water polo so be sure to check it all out! ), an entertainment timetable, info on activities in Alcudia including when the markets are. Outside the front of Marte is the shuttle bus stop to the beach. This runs every 30 minutes from 10am to the beach and from 7.30pm to the port, so you can enjoy some nightlife off site during your stay. These times are valid from mid-June until mid-September, so if you’re staying outside of those dates, find out from Guest Services when you can catch the buses. Just behind Club MAC Marte is our on-site shop where you can buy newspapers and magazines, drinks, sweets, snacks, and loads of other things to make your stay comfortable. One of our popular entertainments for children is our ‘Princess for a Day’. They get the chance to dress up and party like a princess all day with friends old and new. You’ll find the room for this not-to-missed day on the first floor of the Jupiter building. There is also a team of Customer Service staff on hand to help you out between 10am and 6pm. You’ll find them behind the stairs and glass lifts in Jupiter. Check out our website for any other information you need, where you’ll find a map of the site, FAQs and much more. Remember that if you book online with us you’re guaranteed the best deal and it’s free cancellation up to 24 hours before your arrival date.